PLEASE ENCOURAGE YOUR LGBTQ AND ALLY HIGH SCHOOL SENIORS OR CURRENT COLLEGE STUDENTS TO APPLY!!!!!!!!!!! The Hetrick-Martin Institute 2016 College Scholarship is now available. HMI is dedicated to ensuring that our LGBTQ youth are successful in their post-secondary education goals and reach their full potential. Please be sure to share this scholarship information amongst your young scholars, peers, and colleagues. Applicants should be between the ages of 13-24 and should be either entering college or continuing at their college/university for the Fall of 2016. If selected the scholarship funds will go toward their Fall 2016 tuition and fees. In order to be eligible to apply applicants must become HMI members. It is a very simple process that includes a simple intake process and a tour of the facility, all of our services are free. Once the student or youth is a member, they will have full access to the resources and services at HMI. We are located at 2 Astor Place, 3rd floor. The 2016 HMI Scholarship Application is now available. Penguin Random House is offering $22,500 in scholarships for High School Seniors at all NYC Public High Schools to submit written and drawn graphic novel stories. The deadline to submit stories for review is extended to March 28, 2016 and is an excellent opportunity to encourage students that have artistic talent to be published and earn money toward college! The GenCyber CS4CS Cyber Security summer program for girls at NYU Tandon School of Engineering is helping to close the gender gap in STEM. Introduction to female industry role models and hands-on learning in programming, virtuous hacking, and digital forensics will expose participants to new educational and career paths. NYU Tandon School of Engineering is proud to announce a free, three-week program: GenCyber Computer Science for Cyber Security (CS4CS) Summer Program for High School Women. The full-day program, GenCyber CS4CS is one of several national summer programs supported by the National Science Foundation and National Security Agency providing an introduction on the fundamentals of cyber security and computer science. No background or experience in cyber security or computer programming is needed in order to apply. We are looking for young women currently in high school, living in the NYC area, who can commute daily to our downtown Brooklyn campus. NYU’s Information Systems and Internet Security Lab is a national leader in cyber security research and education. With mentorship by women, GenCyber CS4CS provides a unique opportunity for high school women to be introduced to concepts and career opportunities in the exciting field of Cyber Security. Applications are due by April 27th, 2016, 5PM. Program Dates: Weekdays, Tuesday, July 5th through Friday, July 22nd. Time: 9AM to approximately 3 or 4 PM, depending on the day’s activities. Applications are due April 15, 2016. Final applicants will then be interviewed in April or May, and the award will be given at the AHRC Annual Meeting on June 6, 2016 in New York City! If you have any questions, you can call AHRC’s main line at 212-780-2500 and ask to speak with Jesse Backe. LiveOut Loud will award three hardworking LGBT graduating high school seniors with college scholarships for $10,000 in recognition of their leadership, courage, and achievement. Scholarships will be awarded at Live Out Loud’s Spring Gala on April 25, 2016. For further details, please see this flyer. The application is available here. For questions, please contact jd@liveoutloud.info. The NYC DOE Office of Guidance and School Counseling is currently accepting applications for the 2016 Charles Robertson Scholarship. To be eligible, a candidate must be a high school senior scheduled to graduate from a Brooklyn public high school this June. Charles E. Robertson was President of the School Board of the Borough of Brooklyn from 1899 to 1902. As stipulated in his will established in 1937, Charles E. Robertson’s Estate awards a scholarship to one male graduate and one female graduate from a Brooklyn public high school each year,“…not merely on the basis of scholarship, but of equal importance, character, and deportment.” Please note this scholarship is a one time award estimated at $400 given to each recipient. 4. Student personal statement essay (Typed, double-spaced and between 250-500 words), responding to the following question: If you had to write an autobiography, what would the title be and why? Further information is available in the application package. Submitted applications must be postmarked no later thanApril 15, 2016. For questions, please contact Margarita Suero-Duran. Be a high school senior graduating from a New York City public school. Have demonstrated excellence in the field of language. Begin college level studies in the Fall of 2016 majoring in language (either English or foreign). Letter(s) of recommendation from English and/or Foreign Language teachers. Please note the foundation can only process letters written in English. Also note that letters of recommendations should ONLY be from faculty who teach in the fields of English Language Arts or Foreign Language). Optional: Students may also include a piece of their own writing for review. However, only compositions written in English will be reviewed since trustees are not able to evaluate items written in other languages. Additional information is available here. Submitted applications must be postmarked no later than March 20, 2016. For questions, please contact Paul S. Sibener, Esq. at psibeneresq@gmail.com. The American Association of Blacks in Energy is a professional organization of African Americans in the energy industry. Through its Scholarship Program, AABE seeks to help increase the number of African Americans, Hispanics, and Native Americans (under-represented miorities) in energy related fields. By doing so, they help the nation address a critical need and a challenge to our future economic vitality in the world market. Plan to major in business, one of the physical sciences, technology, engineering, or mathematic fields in preparation for a career in the energy sector. Please remove Social Security Numbers from any documents. We are pleased to inform you that the online application for the Jackie Robinson Foundation Scholarship is now available at www.jackierobinson.org. The deadline to submit the application for a Jackie Robinson Foundation Scholarship is February 15, 2016 by 5:00 pm ET. TO learn more about the Jackie Robinson Foundation, please visit their website at www.jackierobinson.org. The American Red Cross is seeking motivated college students to become Campus Coordinators and to go out into their campus communities and the general public to train their fellow classmates, friends, family and other individuals on disaster preparedness. The American Red Cross has partnered with Governor Andrew Cuomo to deliver the Citizen Preparedness Corps. presentations all throughout the State of New York, with a goal of training 20,000 New Yorkers. This presentation is designed to educate individuals on how to prepare for, how to respond and how to recover from any natural, man-made or technological disasters that occur. The Citizens Preparedness Corps College Scholarship Program gives college students the opportunity to educate their community on disaster preparedness, while also giving them the opportunity to earn a scholarship that will assist them with the costs of higher education. Read more about the Red Cross Community Preparedness Scholarship Program, which is also enclosed below. The American Red Cross in New York State has partnered with Governor Cuomo to deliver the Citizen Preparedness Corps presentations all throughout the State of New York, with a goal of training 20,000 New Yorkers. This presentation is designed to educate individuals on how to prepare for, how to respond and how to recover from any natural, man-made or technological disasters that occur. The American Red Cross is seeking motivated college students to fill the role as Campus Coordinators to go out into their campus communities and the general public to train their fellow classmates, friends, family and other individuals on disaster preparedness. The Citizens Preparedness Corps College Scholarship Program gives New York State college students the opportunity to educate their community on disaster preparedness, while also giving college students the opportunity to earn a scholarship that will assist them with the costs of higher education. 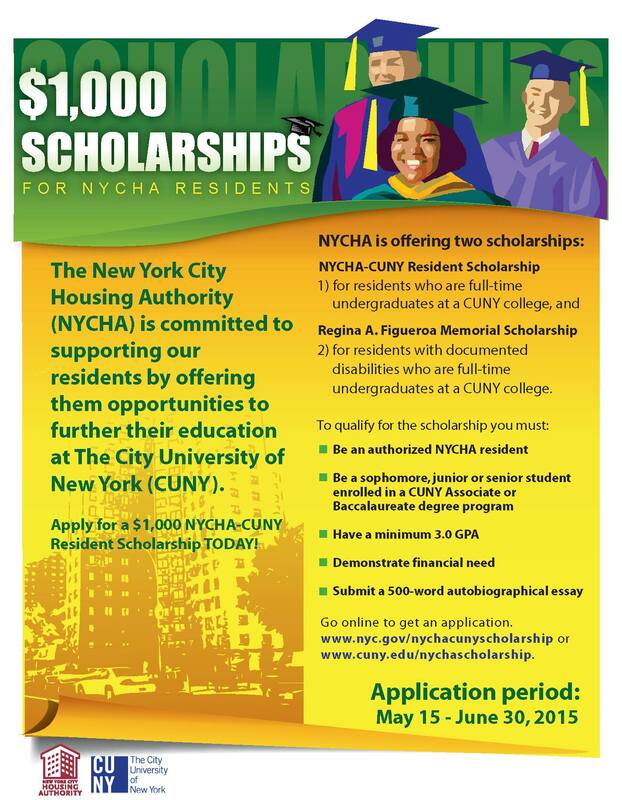 The interested individual must be a student (undergrad or grad) attending an accredited Institution of Higher Education in New York City, Long Island or the Lower Hudson Valley. The interested individual must be able to successfully pass a criminal background check. Scholarships will be awarded based on the number of individuals trained either online or in-person. The Campus Coordinator will be required to train at least 250 individuals in order to be awarded the first scholarship amount. Each Campus Coordinator will be awarded $500 for every tier they advance to (See tier table below). This scholarship program will end at the close of business on March 31st, 2016. The scholarship awards will be paid directly to the school to be posted to the student’s account. For soon to be graduating students who might not have an account balance, the scholarship will be paid directly to their federal or private student loan provider. In order for us to do this, the Campus Coordinator must provide his/her college or student loan provider account number. Campus Coordinators will be working on their respective campus communities to put on presentations or refer individuals to the online training. To assist with getting people to take the on-line training, Student Coordinators will be provided with an IPad by the American Red Cross. Campus Coordinators are encouraged to go outside of their campus to host presentations for the general public and encourage people in the community to take the on-line version of the training. The Campus Coordinator is responsible for any lost, stolen or damaged Red Cross equipment provided in order to perform duties. All equipment must be returned to the Red Cross at the conclusion of the program. Student Coordinators will be asked to check in with the Community Relations Department once a week to discuss their progress and to provide updates on their activities. Please send your resume and cover letter to Alex Lutz, Senior Regional Director, Community Relations at lutz@redcross.org. All interested candidates will be required to schedule an in-person interview at the chapter’s Manhattan headquarters.